An Identifier. This is how the data will be referred to. Remember to use a term that has meaning in the problem domain. Resolution. That is, what’s the smallest difference I can measure? This can become important if your implementation may use fixed point number schemes (for example). This information is all vital to the developers who must design and code interfaces, etc. but it also has benefit when writing use case descriptions – it decouples the behaviour of the system from its data. 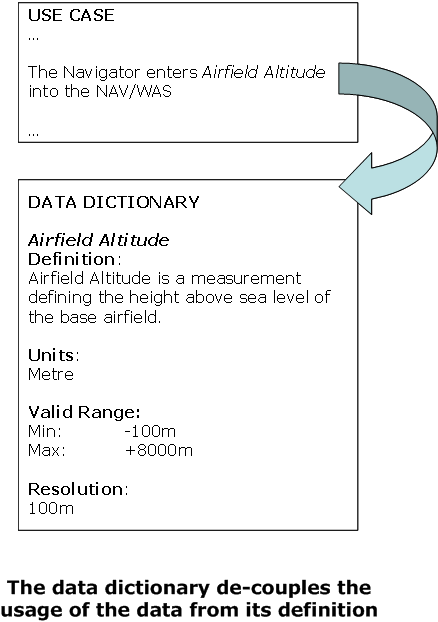 As you define your data dictionary, you can refer to data items (by their name) in the use case text. Use some typographical convention (I use italics) to identify a data item from the data dictionary; or, you could hyperlink it. If the data requirements change you shouldn’t need to change the use case – unless it leads to a change in behaviour. Similarly, you don’t need to elaborately detail exception flows for invalid data. The data dictionary defines what is valid; the use case defines what should happen if we receive invalid data. A simple, clear separation of responsibilities. The Data Dictionary is not a new idea. Twenty years ago, when I started developing software, a Data Dictionary was always created, and was considered a vital part of the design. Unfortunately, it seems to have gone out of fashion, or been forgotten, in many software development circles. This entry was posted in Design Issues and tagged Analysis, Baker's Dozen, Data Dictionary, Requirements, UML, Use Case. Bookmark the permalink.